Four 5* self-catering cottages, sleeping 12 in total. Enjoy our hot-tub and sauna suite, with amazing views. Explore our 1 acre garden and meet the animals. Self-catering cottage for 6 people within five minutes’ walk of the concerts in St Myllin's. The cottage has three bedrooms. Upstairs there is one double with en-suite, one twin and separate bathroom. Downstairs there is one twin with separate cloakroom with shower. No pets and no smoking, please. All linen, fuel and wifi service is included. Our changeover day is Friday which is convenient for concert dates. 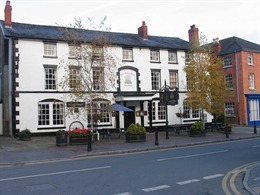 Family-run 12-bedroom coaching inn. Excellent food and warm welcome. Pre-concert meals available from 6.00pm. ***SPECIAL FESTIVAL PROMOTION: Pre-concert meals 2 course £21.95, 3 course £23.95 from 5.30.pm. High Street, Llanfyllin, Powys, SY22 5AQ. Pre-concert meals from 6.00pm. Please book. Powis Castle – 30 minutes from Llanfyllin. Stunningly beautiful castle and gardens. Welshpool – a fine market town which you can visit en route to Powis Castle. Town of Llanfyllin – it received its Royal Charter in 1293 and has some very fine Georgian and Victorian architecture. Llanfyllin Workhouse – featured on BBC TV's Restoration programme, the Workhouse is being restored and turned into a centre for arts, the environment and the community www.llanfyllinworkhouse.org. Most summers it has one of the most successful small Glastonbury-style Festivals in the UK . Llanrhaeadr Waterfall – 30 minutes from Llanfyllin. The highest waterfall in Wales and the highest single drop waterfall in the UK. St Melangell's Church, Pennant Melangell – 30 minutes from Llanfyllin. The church stands in a round churchyard, once a Bronze Age site, ringed by ancient yew trees estimated to be two thousand years old. Parts of the building date from the 12th Century including the shrine to St Melangell which is a unique monument in Britain.